Young Sandhill Cranes are called colts. People are surprised the baby crane designation is the same as a horse. However with those long legs and their love of running there are similarities if only in concept. 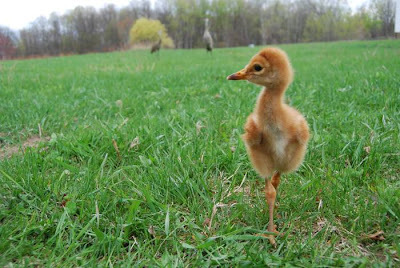 We raise Sandhill Crane colts every year at REGI. Usually we have more than one at a time. 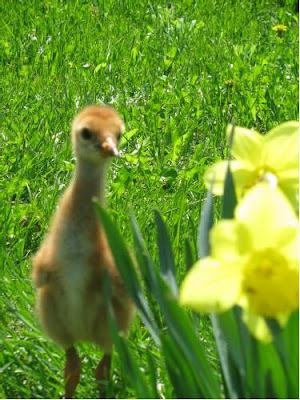 A week ago today we admitted a day old Sandhill Crane colt into care at REGI. The colt was admitted measuring six inches tall. He was in critical condition. We had a few very rough days before the little one turned to corner to better health. He has more than doubled his size in the ensuing week. 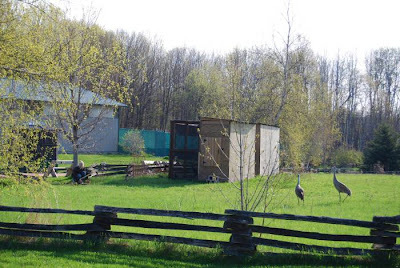 The day after the colt was admitted a pair of wild cranes that nest on REGI property appeared without their colt. The couple is a new pair. They have not been parents together before. Like new parents of any species it takes a little coordination to be good parents. The lives of wild birds hang in a fragile balance. One mis-step by a parent, or a second of distraction can lead to death for the youngster. That is particularly true in those ultra delicate first days of life. We are not certain what happened to the colt. What is certain is the pair no longer has a baby with them. We were feeling terrible for them and then realized we may just have the key to their future happiness in our care. Each day the wild pair spends most of the day very near. They walk within five feet of us while we are exercising the youngster. They vocalize to him constantly as if to underscore they want a place in his life. We are elated with their interest and hope we can allow him to go with his new parents soon. Due in part to the continued freezing temperatures in our region this year, we need to wait before we allow them to take him with them. So far the experience has been nothing short of incredible for us. Never before have we been able to get this close to the wild cranes. They seem to be including us in their family unit. We will continue the saga as it goes. For now the colt is still with us and in a brooder for most of the day and night. He is walked as much as possible and is growing very well. We are working hard to make sure he is not imprinted to humans. Because of that our interaction with the colt will minimize and with it the photos ops. Enjoy the photos of his first week at REGI. We will bring you more as we can. Great Pics.. What a Happy Healthy Looking little guy... Thanks for sharing his story! Hi.. Great Pics.. Looks like he is doing well! Thanks for sharing his story.